Thiamine and Heart Disease: What is Thiamine? Thiamine is one of the water-soluble B vitamins. 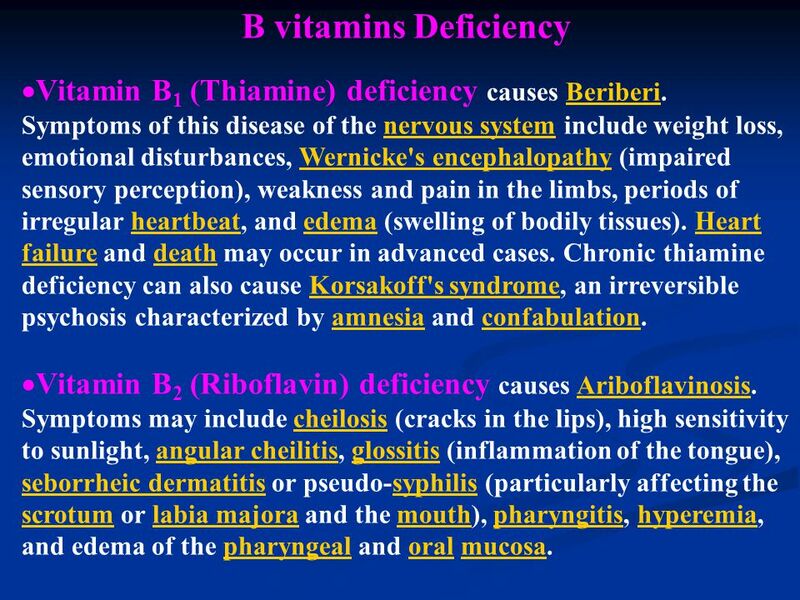 It is also known as vitamin B1. Thiamine is naturally present in some foods, added to some food products and available as a dietary supplement. This vitamin plays a critical role in energy metabolism and, therefore, in the growth, development, and function of cells. Congestive heart failure (CHF) is a serious public health concern. Approximately 5.3 million people in America have CHF, and more than 500,000 people are diagnosed each year. Although there have been groundbreaking therapies such as beta blockers and ace inhibitors, CHF remains a leading cause of morbidity and mortality. It is estimated that 30-98% of patients with CHF have a thiamine deficiency. Thiamine has a direct effect on the action of cardiomyocytes (improved energy production and thus improved cardiac function. Thiamine acts as a coenzyme for oxidation-reduction reactions in the body. Thiamine is involved in the oxidative functions of the mitochondria. Thiamine has been proven to cause cardiac hypertrophy, depressed cardiac contractility, and arrhythmias. Thiamine is absorbed in the ileum and jejunum in the small intestines. Most of the absorption is by active transport. After thiamine is absorbed, it travels to the liver, and then it enters the red blood cells. Thiamine is not protein bound, therefore it is easily filtered by the kidneys. This is one of the reasons why taking diuretics can result in a thiamine deficiency. The irony is that the majority of cardiac treatment regimens involved diuretics. Since thiamine is water soluble, the kidneys will also excrete excess thiamine. Any factors that increase the flow of urine, will increase the excretion of thiamine. Serum Thiamine Levels – This lab represents short-term thiamine intake. Urinary thiamine levels – This lab level does not represent body thiamine stores. Erythrocyte transketolase – This is a very sensitive test. Erythrocyte thiamine pyrophosphate analysis – This is the most sensitive test. The RDA for Thiamine is 1.1-1.2 mg/day. This is an excellent brand: NOW Vitamin B-1 (Thiamine) 100 mg,100 Tablets. 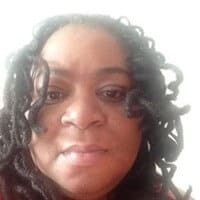 However, people who are at risk for thiamine deficiency should take 100mg three times a day until the levels have normalized. Alcoholics should take 50mg/day. Thiamine is one of the B vitamins that are crucial to heart health. 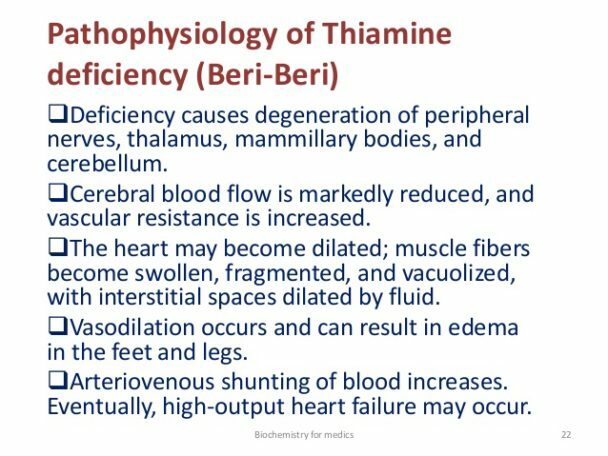 Thiamine deficiency can cause heart failure and neuropathy. Thiamine supplements can be helpful in getting your required daily thiamine requirements.